Thomas Larcher stands out as one of the most imaginative voices in classical music today. 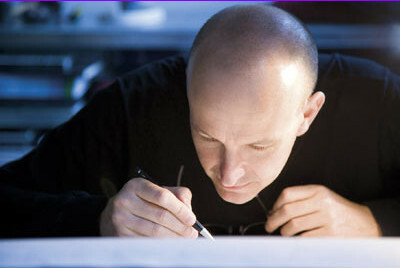 Born in Innsbruck in 1963, Larcher grew up in Austrian Tyrol and studied composition and piano in Vienna. Today he is celebrated internationally as a composer, pianist and programmer. His music is inventive and captivating, as he combines contemplative harmonies with extended performance techniques – at once experimental and responsive to tradition. Larcher’s early works are characterized by his preoccupation with the piano and its tonal qualities. He established new benchmarks in piano literature with compositions such as Naunz for piano solo (1989), Kraken for violin, cello and piano (1994/5) , and Mumien for cello and piano (2001). A series of string quartets Cold Farmer (1999), Ixxu (1998-2004), and Madhares (2006/7) continued his path of exploration, absorbing and crossing stylistic boundaries, ‘wandering freely among musical traditions’. A forth string quartet followed in 2015: lucid dreams was commissioned by the Belcea Quartet’s 20th anniversary season with performances in London, Vienna, Luxembourg, Berlin and Grenoble. All the quartets contain highly original sounds, often derived from extended string playing techniques. Larcher began using the colourful timbres of the orchestra, starting with his solo concertos Still (2002) for viola and orchestra, Böse Zellen for piano and chamber orchestra (2006) and the Violin Concerto (2008) written for Isabelle Faust. Ouroboros (2015) for cello and chamber orchestra written for Jean-Guihen Queyras and premiered with multiple performances all over Europe aswell as in Hong Kong. Larcher’s skill in writing for voice is evident in his astonishing and highly original works for ensemble and orchestra including My Illness is the Medicine I Need (2002) for soprano and piano trio, a much performed work that has recently been arranged by the composer in a version for chamber orchestra, Heute (2005) for soprano and orchestra, and Die Nacht der Verlorenen (2008) for Matthias Goerne and the London Sinfonietta. His first large orchestral score, written for the San Francisco Symphony in 2011 and conducted by Osmo Vanska, was Red and Green, a pair of movements with contrasting tonal colouring. He continued to explore the broad spectrum of orchestral sounds and possibilities in 2014 with A Padmore Cycle, originally for tenor and prepared piano, which he recomposed as an orchestral score with voice. It was premiered by the BBCSO under Edward Gardner in November 2014. His first symphony for baritone and orchestra, Alle Tage, was premiered in 2015 by Matthias Goerne with Jaap van Zweden and the Netherlands Radio Orchestra at the Concertgebouw Amsterdam, and co-commissioned by Leipzig Gewandhaus Orchestra and NSO Washington. Thomas Larcher’s Symphony No. 2 Kenotaph followed in 2016, commissioned by Vienna Philharmonic Orchestra and premiered with Semyon Bychkov at the Musikverein in June 2016. Premieres in the UK, in Germany and Holland followed in 2016 and 2017. A shorter orchestral score, Chiasma, for Andris Nelsons and Leipzig Gewandhaus Orchestra was premiered in March 2018. Larcher’s first opera Das Jagdgewehr (The Hunting Gun) written for Bregenz Festival was premiered in summer 2018. Season 19/20 brings the opera’s UK premiere in June 2019 at Aldeburgh festival, where Thomas Larcher is one of three Artists in Residence. Furthermore two orchestral pieces will make their debut in the US: Symphony No. 2 Kenotaph will be performed by New York Philharmonic under Semyon Bychkov in April, and the piano concerto Böse Zellen will be performed by Seattle Symphony, Ludovic Morlot and Cristina Valdes in March. Further premieres of Thomas Larcher’s orchestral scores in 19/20 will be in Finland (Kenotaph), the UK (Alle Tage, Chiasma) and the Czech Republic (Böse Zellen). Currently Thomas Larcher is working on his third symphony for Concertgebouw Orkest and a piano piece which will be premiered by Paul Lewis at Aldeburgh festival 2019. Larcher is an international highly acclaimed composer. In 2012 Larcher was awarded the International category of the British Music Awards for the Double Concerto for violin and cello, commissioned and premiered at the BBC Proms with Viktoria Mullova and Matthew Barley under the direction of Ilan Volkov. In 2015 he received the Austrian Kunstpreis for music aswell as the Chamber Music Society of Lincoln Center’s Elise L. Stoeger Prize 2014/15 awarded every two years in recognition of significant contributions to the field of chamber music composition. In 2018 he was awarded the Ernst Krenek Prize of the City of Vienna and Le Prix de Composition Musicale of Fondation Prince Pierre (Monaco) for Symphony Nr. 2 Kenotaph (2016). He has been Composer in Residence at the Vienna Konzerthaus, the Mozarteum Orchester, Wigmore Hall, and many festivals including Davos, Heimbach, Risör, Mondsee and Bantry. ECM has recorded three discs of Larcher’s works, establishing his distinctive voice: Naunz (2001) was nominated editor’s choice by Gramophone; Ixxu (2006) received the Preis der Deutschen Schallplattenkritik; and Madhares (2010). What Becomes with Mark Padmore and Tamara Stefanovich was released on Harmonia Mundi in 2014. His recordings have been awarded several international prizes, including the Preis der deutschen Schallplattenkritik, the Choc de la musique and the Diapason d’Or. Larcher is highly regarded as a pianist ; his repertoire is broad, ranging from his Schubert/Schönberg CD with ECM to accompanying Mark Padmore in Schubert’s Schwanengesang. Through thoughtful programming that reveals links, contrasts and comparisons, he has a special ability to cast new light on the established repertoire whilst his performances of the music of our time are particularly illuminating. In 1994 Larcher founded the festival Klangspuren, now an international renowned festival for contemporary music. He stepped down in 2003 to establish the Swarowski Music im Riesen festival in Wattens, Austria which he still runs, a gathering of the best international chamber musicians in May each year.